Dougal Shaw, BBC video innovation journalist, spent four weeks on what he described as a 'mojo diet' – but could he stomach it? When Dougal Shaw, BBC video innovation journalist, accidentally drained the battery of his camera before a shoot at his local café, he had two choices: go home, or go mobile. 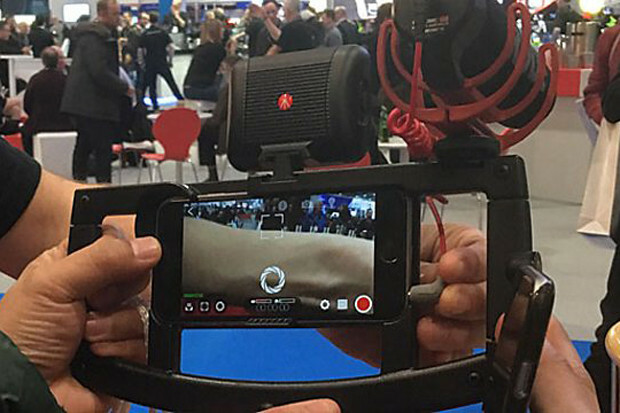 Choosing the latter, he filmed his required shots, interviews and all, entirely on his phone – and was so satisfied with the results, he choose to ditch his trusted Canon C100 camera for a month in June and work exclusively on his iPhone 6S Plus. "I've been interested in it for a while," said Shaw, who is accustomed to using his phone to shoot in conjunction with his DSLR camera in what he describes as 'hybrid journalism', spicing up dull shots with short cutaways, capturing better audio, or mounting it on his camera for dual wide shots. "Over the last couple of years the quality of video that you can get on your phone has really improved – you can see it when you are editing on the computer and there's not much of a difference between what you've filmed with your normal broadcast camera, and what you've done with the smartphone." Shaw, who also blogged about his work, chronicled his month of mobile-only filming on Twitter in June, noting how the mojo (mobile journalism) diet was affecting his day-to-day job creating video features in the BBC Business Unit, getting tips and advice along the way. From Amsterdam to Glasgow, and London to Peterborough, Shaw had various experiences using a range of equipment, and explained to Journalism.co.uk that the immediate benefits of mobile equipment were how light and compact it is. "When you're going round normally as a video journalist, you're the sound technician, lighting man, producer and camera operator, so you're carrying a lot of kit yourself – it's a complete headache," he said. "But when you go mobile, all of a sudden everything you need is in a rucksack – it's a bit like being a radio journalist where you become very nimble and there's nowhere you can't go, and very quickly you can be out of the building, out filming, and there's no mucking around." For example, when traveling to Amsterdam to film interviews for his CEO Secrets feature for the BBC Business Unit, he didn't need a taxi to the airport with all his kit, saved £30 as he didn't have to check his big camera in, and sailed through security without his large camera kit being inspected. Along with his 64GB iPhone 6S Plus, Shaw used the Filmic Pro app to have more control over his shots and audio during the month, and used stabilisation equipment such as an iOgrapher rig and a light Manfrotto tripod to achieve a more professional feel to his footage. "The picture quality you can get on the phone now is extremely good so it's quite rare that you have to worry about how good that is, but the big thing that is going to hold you back is sound," he said. "I used the Rode VideoGo mic which goes on top of the phone, which is great for picking up atmosphere, and the Rode Lavalier mics, which are easy to use, even in louder areas, as they just plug those into your headphone jack and then clip on to someone. I also used Filmic Pro where I could moderate the audio gain with my headphones plugged in." Shaw also used a selfie stick to achieve aerial shots, as the phone is stable when holding a selfie stick or light tripod in the air. "It's almost like having a little drone where you can get ceiling high views of the scene you're filming, or you can hold the phone on the selfie stick and get really up close to your subject and film around them," he said. In fact, he found that by using his selfie stick, he was able to stay further away from his subjects when filming close-ups, and not have to stick a large camera in front of them, helping them to feel relaxed about being filmed and less intimidated, even when he was in Glasgow discussing sensitive subjects like autism. "When you're filming someone who is a bit of a nervous contributor, or a member of the public who hasn't had media training, they can clam up a bit when they've got a big camera in their face as they feel overwhelmed. But if you're doing it on the phone, it's much smaller and an object they're used to, so their definitely much more relaxed and forthcoming in interviews," he said. He said that he found this familiarity of the phone useful when asking security staff for filming permissions. "I was out filming near Liverpool Street, and I wanted to get some nice shots of the skyscrapers there, and I asked the security if it was okay for me to film and he said, 'well, not if it's on the tripod, what kind of filming are you doing?' and I said, "I'm doing it on my phone" – and then he said to go for it." "You can't use this to get round proper concerns when you're not allowed to film, but there is quite often a grey area where technically, you're not meant to film, but if you're open about it and you just say 'I'm just going to film some things' so they know what you're doing, the fact you're doing it on a mobile phone makes them feel much more relaxed," he explained. But although there were benefits to filming on a phone, Shaw chose not to edit on his mobile, finding it fiddly on such a small screen, and opted for using Final Cut X on his Apple laptop instead. "Some people think that mobile journalism is all about doing everything on your mobile phone, but for me it's more about being mobile, and not being encumbered by all of your heavy kit," he said. "I actually spend a lot of time improving the shots that I've made on my iPhone in the edit – adding movement, improving the colour and using the filters." Additionally, he ran into problems when filming a close-up on a very bright day – it was hard to see the shot on his phone’s screen in the light. "I think the picture I can get on the iPhone is fantastic, but it's not quite as good as the beautiful shallow depth of field shot that I can get on my Canon C100, so sometimes I missed that a little bit." However, Shaw found that using mobile equipment gave him a much faster turnaround when publishing a Snapchat story on the BBC News account, which allowed him to promote his story straight away by directly uploading the clips onto social media. Now the 'mojo diet' has finished, Shaw is still keen to film his video features using mojo equipment, but is not adverse to using his professional DSLR kit. He notes that although the technology allows for anyone with an iPhone to shoot video, not everyone will become a mobile journalist overnight. Instead, it offers an excellent opportunity for radio journalists who want to integrate mobile video journalism into their workflow. "There's a big difference in making a video of your mates that you stick on social media, and doing something that's professional," he said. "It's about knowing the visual grammar, such as how to put a story together, getting strong opening shots and bulding a sequence. "These are all part of the specialism that journalists have as storytellers, and we take that for granted. So, for me it's just an extra tool for people who do this as a living anyway."